Corsair has added yet one more product to their ever growing gaming peripheral repertoire with their launch of the GLAIVE RGB Gaming Mouse. If you’re like me, the word glaive drew a big blank so I had to look it up to find out that it simply means ‘sword’. Being that a sword is an instrument of warfare and many games are combat based, it seems as an appropriate a appellation as any. It also follows the seemingly growing trend of titling it in all caps which is probably some clever marketing trick to make the product stand out in a listing or triggering some memory mnemonic in prospective customers. Maybe it’s none of the above and I’m simply reading too much into it. Either way, we have our hot hands on one to see if it meets one of their taglines of “Winning never felt so good”. Sword in hand, we plunge ahead. 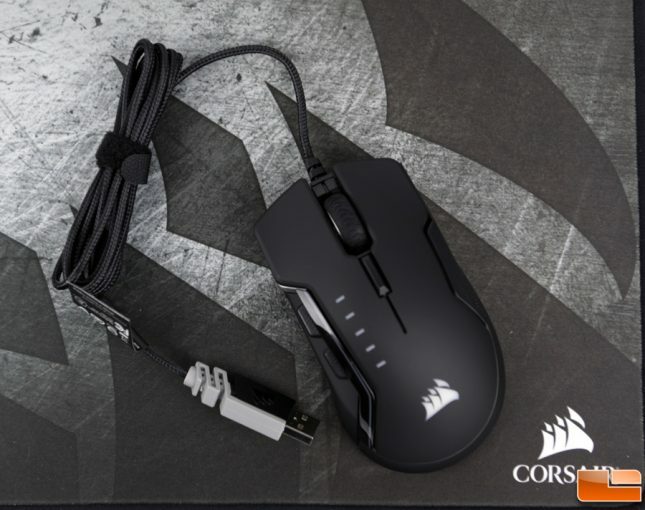 Corsair has a varying array of products, both gaming segment focused as well as basic to enthusiast level PC related parts and accessories. In the gaming world, their keyboards, headsets, and mice are very popular and with good reason, they make some excellent products. 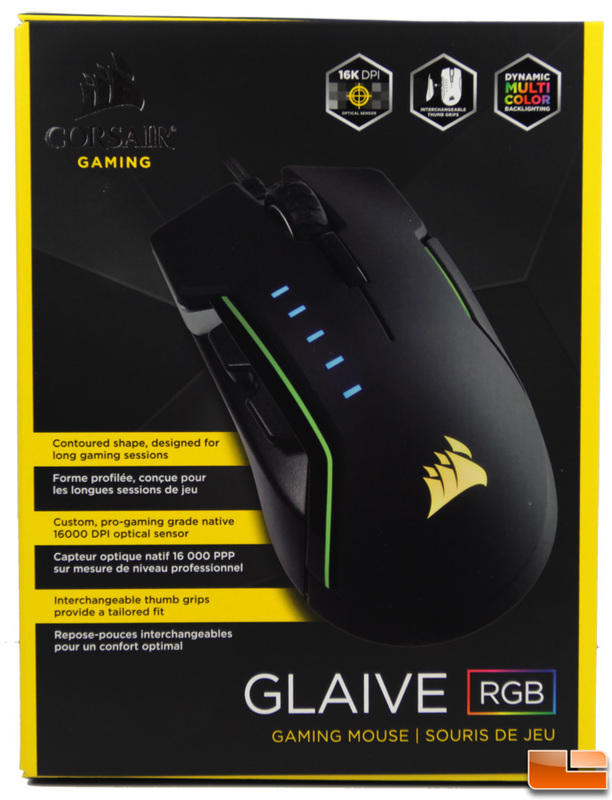 The GLAIVE RGB is not that big of a departure from their popular M65 PRO RGB gaming mouse. In fact, I happen to own one which I’ve been using for several months so it makes for a nice comparison. 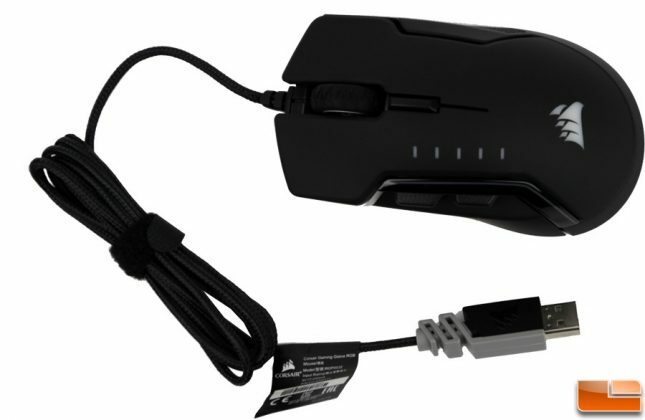 Retailing for $69.99, it features a very nice range of features and options that should check most boxes for those looking for a new gaming mouse. It comes in two flavors, an aluminum accented version and an all-black version (which we received), though otherwise identical in features. The 1.8 meter cord is comprised of nicely braided black fiber that makes sure there’s no interference like we sometimes get with wireless mice and supports a superb 1000Hz/1ms refresh rate. The most notable feature in my mind and where it differs the most from the M65 PRO ($51 shipped) is the included interchangeable thumb grips (three total) that allow easy customization based on needs or preferences whereas the M65 PRO RGB mouse has removable weights for customization. The GLAIVE weighs in at 122 grams versus the M65 PRO RGB that can range from 115 – 135 grams. Corsair built it with some quality components starting with a custom PMW3367 Pixart optical sensor and tacking on some Omron switches rated for 50 million clicks. To put this in perspective, to reach 50 million clicks you’d need to click the button 13,699 times every single day for 10 years. If you’re a weekend only gamer, make that 48,077 clicks a day every weekend for 10 years. So, you can blast away at your virtual enemies without fear of failure and gamers know these buttons can really take a beating though I’d hazard a guess, no one is hitting 50 millions clicks in less than 10 years. Should the worst happen, Corsair does back it up with a pretty standard 2-year warranty. In addition to the Omron left/right buttons, there are forward/back thumb buttons, a DPI button behind the scroll wheel, and the scroll wheel itself clicks as a button. No extra macro or dedicated sniper buttons, nor any fancy touch sensitive areas. Weight (w/o cable and accessories): 122g / 0.27 lbs. 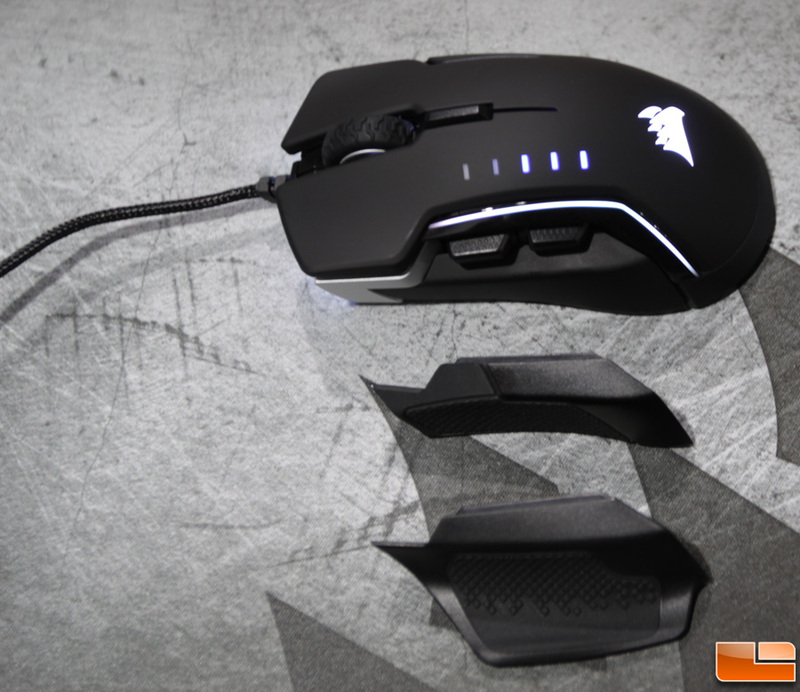 Custom, gaming grade 16000 DPI optical sensor: Ultra-accurate and high-speed tracking engine. Native 16000 DPI resolution, settable to 1 DPI steps, can be custom tuned to virtually any type of mouse pad. All-new, high-performance Omron switches rated for 50 million clicks: Custom tuned for gaming, providing an ultrafast response and reliability over time. Dynamic multicolor 3-zone backlighting: Customizable backlighting immerses you in the game by providing nearly unlimited lighting adjustability. As the name implies, there’s a large array of RGB back-lighting colors to choose from for each of the three zones to bring the bling and there are five DPI preset options that range from 100 to 16,000 DPI – both of which are fully adjustable through software profile settings that we’ll look at later. Customized lighting is almost a requirement these days to entice the masses. In the box we found a quick guide, a warranty guide, the two extra thumb grip pieces, and a nice little bag to store them in. Now that we’ve been introduced to the hardware, let’s look at Corsair’s software that brings it all together.